2. Place the slices of bread on a clean work surface. 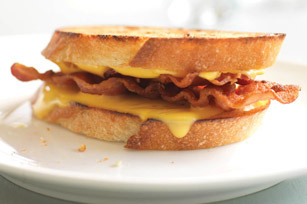 Butter and layer 2 of the bread slices with a slice of cheese; sliced tomato and top with 4 strips of crispy bacon. Grind on fresh black pepper and sprinkle with little salt and finally the remaining slices of cheese. 4. Place bread buttered side down in a fry pan over medium-high heat. Cover with lid and let cook for 3-4 minutes or until golden and the cheese is melted.